An inexpensive item can always be a 'bang' or a 'bust'. This being only a few dollars, I was not sure. But it is perfect for my needs...I don't like wearing the provided 'headset' which is provided with the dictation software, Dragon Naturally Speaking, and this convenient microphone sitting on my desk, on the left as the mouse is on the right of the keyboard, makes a nice complement to my workspace. The older style mini-plug will plug into any PC, new or old, in the Audio In port, and there is no setup - just plug it, reboot, and go! The computer recognizes it as a new device, and so does Dragon, and you are all set! A great value in my opinion. When not in use, I just turn it away from me, toward the computer screen, and it is out of the way, but handy. The voice pickup is perfect -- clean and clear. Got this microphone to skype for work, and it seemed to work fairly well for about a month. * It picked up a lot of noise around it rather than directly in front of it, but as long as the surrounding area was reasonably quiet other people could understand me fine. * I had to be within 1-1.5 ft of the mic for it to pick me up at all. Despite that, after about a month, it completely stopped working. Still recognized as a mic when I plug it in, but no sound received. I had not been moving it, unplugging/replugging it, nothing. It had just been sitting on my desk immobile, and one day in the middle of me talking it stopped working. My other microphone works fine plugged into the same port, and this MIC does not work plugged into another laptop, so it's definitely the mic. I use my other microphone now. At the price, it's not really worth my time and return shipping to RMA it. I guess you get what you pay for, avoid this one and pay a bit more to get a decent microphone. It's such a low price but honestly, works like a charm. It's sturdy and everyone has been able to hear me so far. The only complaint I heard is that once, I moved it against the table and apparently it sounded like "trucks slamming their breaks on ice" buuuut that may have been my fault. Because of how I moved it, I mean. I've used this microphone for over 3 years and have recommended it to several friends asking for my advice on a good microphone for chat applications. I also love that it comes with both a desktop stand and optional adhesive mount to attach to the side of your monitor to push up out of the way when not in use. I have found when using this with Google Talk, Google Voice, Magic Jack & Skype, I can walk around the room and communicate clearly, just as if the person was sitting in my room. I have even walked to refill a drink in my kitchen and only had to raise my voice as I would normally, as when talking to company from a distance. Although my last order didn't come in a fancy retail enclosure or with instructions, Don't worry, just plug it into your Audio-In port! All applications I have used automatically recognized it. This is a Great Microphone at a Great Price! I bought this microphone to be able to make simple Skype calls. I wasn't buying it with the intention of doing anything more elaborate than an occasional voice recording or online phone call. It works amazingly well for the price. Of course, you get what you pay for. What do I mean? 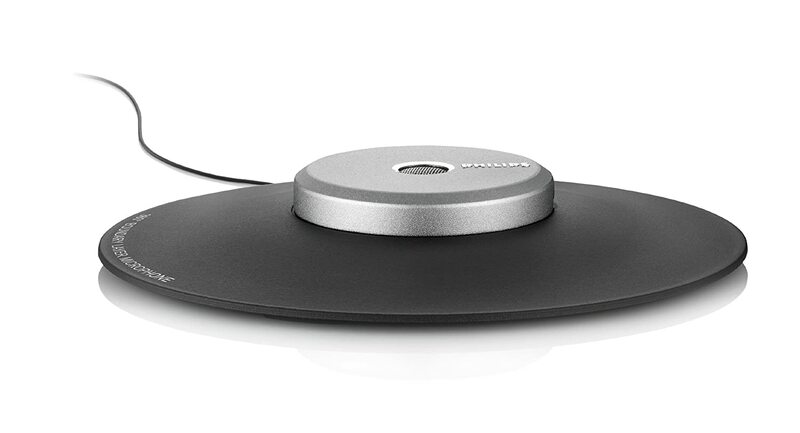 It feel really cheap (because it is), the sound doesn't filter out background noise very well (picks up lots of popping too if you're too close), and I feel like it would shatter to a million pieces if I were to step on it by accident. Or maybe pull the wire by accident. But for the price, this thing is excellent! It works as advertised, but PLEASE NOTE that this is an ANALOG connection. Means that it only works with a dedicated, analog microphone port. If you have a line-in port (like on newer computers, especially Macs), this will NOT work. 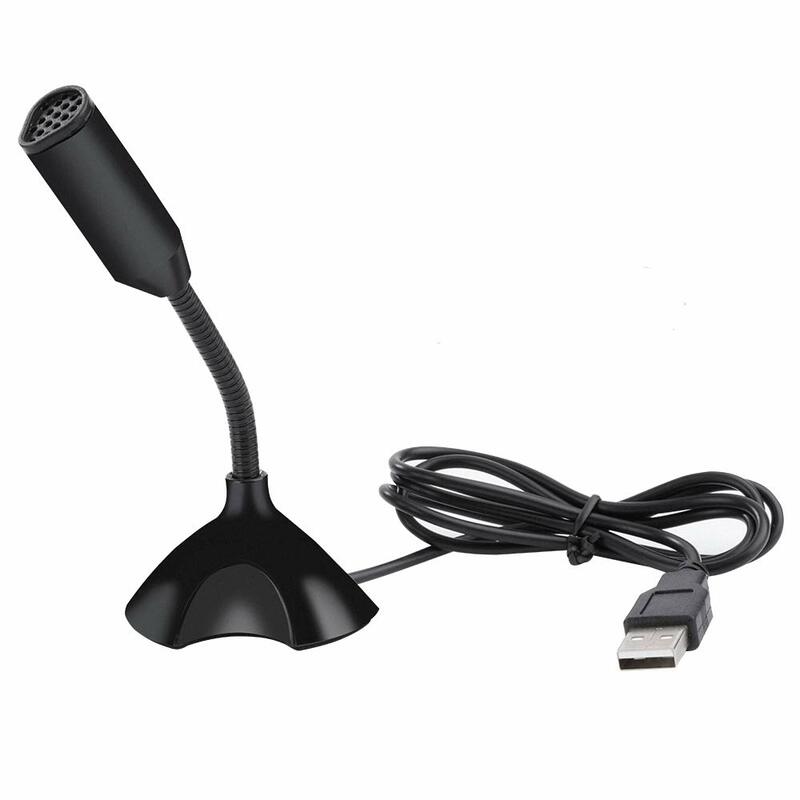 You will have to get a USB microphone. I bought this to use with speech recognition in Windows 7. It sits on my desktop, about 2 feet from my face. When training the computer (part of first setting up speech recognition) Windows warns you that a headset mike would be better, and desktop mikes aren't optimal for speech recognition. This mike, though, has been working perfectly; the computer has had no trouble hearing me. 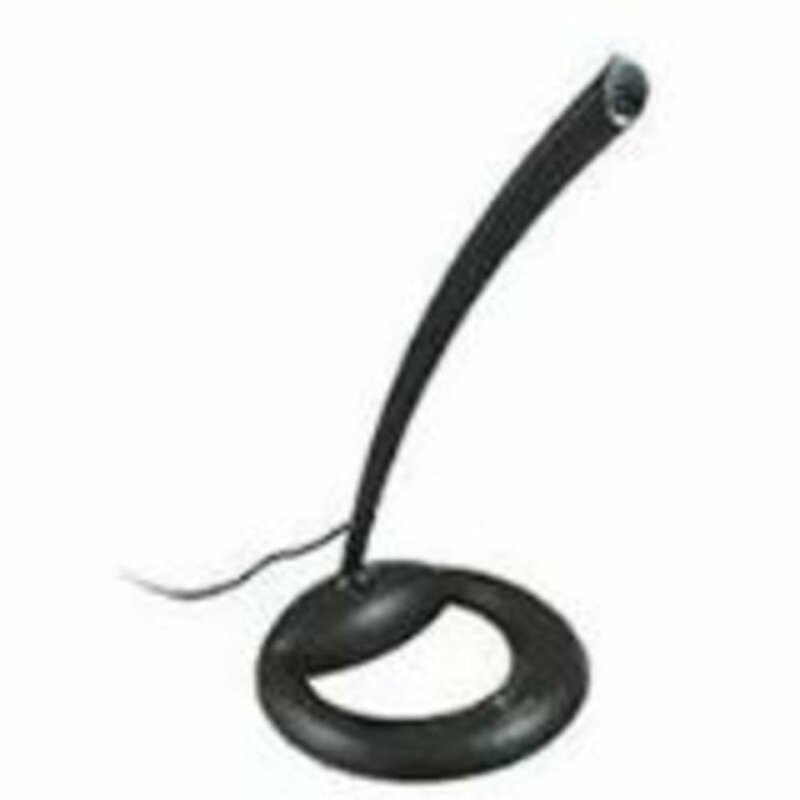 The cord is nice and long, the stand is stable and sturdy and the mike angle is adjustable. Windows recognized it right away. It's a basic microphone, and it works just fine for my purposes. 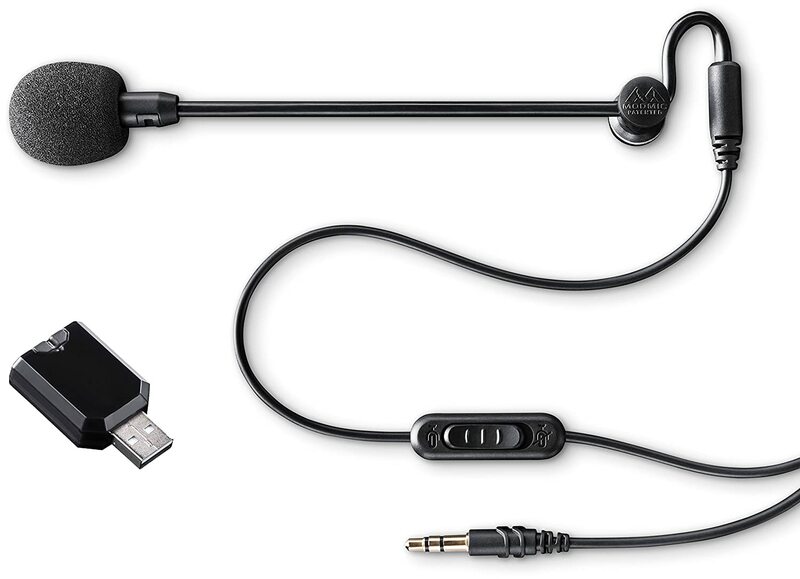 I got this b/c I normally don't need a mic, so I didn't want a headset-mic combo. Plus I had a perfectly good set of headphones already. At first I thought this was a dud, b/c even though my PC knew it was plugged in, the mic wasn't picking up any sound, or it was so faint that the sound recorder wasn't registering it. I tried again after about half an hour (it was left plugged in all the while), and it works now. So maybe it just needed time to install the drivers or whatever. But now it works pretty well. Does a great job of eliminating background noise. I had a coworker talking on her phone in the cubicle next to mine, and it didn't pick up a thing, just my voice. If you turn the mic levels all the way up, though, you'll get a lot of static. Experiment with sound recorder to see how far you can keep it from you. I normally use it pretty close to me, and facing me. Have only used it for a couple of days. Here's hoping it lasts!